Home » Entertainment » Who Is Tituss Burgess' Partner? Gay Man Married Or Rising From Ruins? American singer and actor Tituss Burgess' love life remained a mystery until the ambitious actor opened about the matter himself. 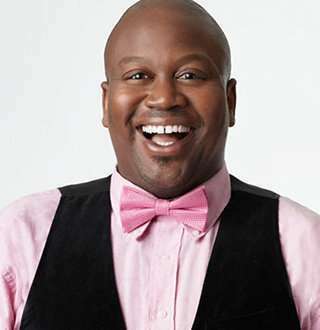 The Georgia native is best known for his Critics’ Choice Television Award-nominated portrayal of Titus Andromedon in the Netflix sitcom Unbreakable Kimmy Schmidt. Before rising to the popularity, he was known primarily for his work on Broadway plays. Born to an American family on 21 February 1979 in Athens, Georgia, Tituss graduated with a BA in music from The University of Georgia. He was the only child in his family and was raised by a single mother, Sandra Burgess-Morse. Tituss used to spend the summer at his grandparents’ home in Georgia when he was a kid. He was always a grandma’s boy. Tituss's professional acting career began in 2003 when he moved to New Yor in 2003 and was cast in a show at the Fringe Festival. Later in 2005, he made his Broadway debut through the musical, Good Vibrations. He introduced the role of "Sebastian the Crab" in the musical show The Little Mermaid in 2007. Time Pass the Broadway musical artist Tituss found fame playing the gay role of aspiring performer Titus Andromedon on his Netflix's hit series Unbreakable Kimmy Schmidt. Tituss portrays the character of Theodore Toney in the upcoming biographical-dramedy, Dolemite Is My Name. The movie, which is set to release in 2019 features the also stars established Hollywood A-listers such as Eddie Murphy, Wesley Snipes, and Mike Epps. Moreover, he has an interest in music as well which led him to release an album titled Comfortable in 2012. Tituss's achievement in his carer is manifested by the awards he recieved for his captivating performance on movies and series. He was nominated for Broadway.com Audience Award in a category of Favorite Featured Actor in a Musical for his role on The Little Mermaid in 2008. Similarly, his work on Unbreakable Kimmy Schmid sitcom yielded the numerous awards and nominations. In 2015, he won Webby Award for best actor and Gold Derby TV Award for Best Supporting Actor in a Comedy for his role on the sitcom. He has received back-to-back four Primetime Emmy Award for Outstanding Supporting Actor in a Comedy Series nominations. When it comes to earning, he has undoubtedly garnered the prominent part of net worth from his long stint to the acting profession. He reportedly earns about $90,000 per episode from Unbreakable Kimmy Schmid. Along with the worldwide recognition and immense height of success, he has earned enormous wealth in his life from his acting career, which reflects in his net worth of $5 million. At a screening for the movie Time Pass, Tituss told the crowd that he never had any trouble being himself even though Tituss being himself was a problem for a lot of people. I want to call attention to how normal our lives are, and to how powerful our messages are, and to have patience with those people who don't understand who we are for whatever reason… I know I am preaching to the choir, but we can't hide. We just can't. An openly gay actor had been quite a secretive about his romantic affairs and married life, and his love life remained a mystery until he revealed the matter himself back in 2016.
Who Is Openly Gay Tituss Burgess's Partner? In an interview with New York Times Sunday Routine back in April 2016, he confessed that he lived in Harlem with his partner, Pablo Salinas and their dogs on Sundays. Not many details about who he is and what he does are still unavailable. But one thing is clear that he is really close to Tituss, and they together attend many important events together. On 15 September 2017, the openly gay partners were spotted together at the at the 2017 Performers Nominee Reception, presented by the Television Academy at the Wallis Annenberg Center for the Performing Arts in Beverly Hills, California. Moreover, recently on 10 June 2018, they together attended The Tony Awards red carpet at Radio City Music Hall. They were giving their smile holding hands together for the picture. In the picture, Tituss looked a bit taller in height than his partner Pablo but the pair looked stupendously matching in suits. Till date, Tituss has not opened up publicly about the plans of when he is going to get married. Thus, it's still unclear when Pablo will be his husband/wife. Bill Hemmer's Sexuality Revelation! Rumored Gay Man Dating Or Married?